When an object is seen, what we see is the external dimensions of contour. What we don’t see are the internal dimensions, the connections of the geometry of architecture that holds the shape together. When you observe cells as parts of an organ that is the dilemma of distortion that exists as you look further at the scale of attachments eventually getting down to the nano level of cell interactions, that’s when things change course. Shape is determined from the inside supporting structure toward defining the external appearance. Athletes complain a lot about their neck following a concussion. Lets get into some of the detail. Physiotherapists are also noticing that paying attention to rehabilitating neck muscles appears to be improving the concussion to heal, what might be happening here? First there are some serious structures in the neck. So what does the neck have to do with concussions? It looks like quite a lot. Reports from simulated concussion producing hits mimicking NFL football players have been mapped in detail, I will be referring in detail to the motions in the 3 planes x-y-z. Just for orientation sake x is the anterior posterior line, y is the lateral line as if between both ears perpendicular to the x front-back line and z is the vertical line coming through the apex at the top of the head down through the neck. 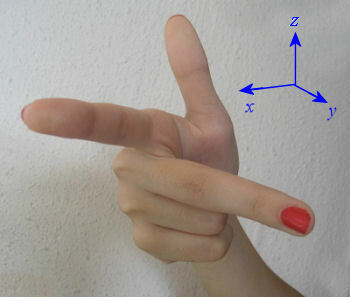 Take your right hand in front of you make like a gun with the thumb pointing up, that’s the z axis, the index finger is the x-axis pointing to your left and if you make your middle finger point directly at you that is the y axis, finger tip being the posterior and the joint where the finger comes from the hand the anterior part of the y axis. “The striking player lines up his head, neck, and torso and drives through the other player. The collision first involves compression of the padded helmet liners as impact force increases. This causes the struck player’s head to move to the right and rotate primarily about the z axis (superior- inferior anatomic axis). There is also lateral bending of the neck about the x axis (anterior-posterior anatomic axis). Near the end, the helmets slide off each other. ” This citation is quoted from NEUROSURGERY VOLUME 61 Number 2 AUGUST 2007 authored by DC Viano, IR Casson, EJ Pellman Concussion in Professional Football:Biomechanics of the Struck Player-Part 14. So as you can see from the first description of a tackling contact, there is a observed neck strain occurring after the impact. Take that gun pointing hand in front of you , now move your thumb and rotate the thumb on its axis toward you. Well you can’t do that without dislocating your thumb but that is the kind of resulting neck deflection that is happening. So why am I emphasizing this neck bending rotation? 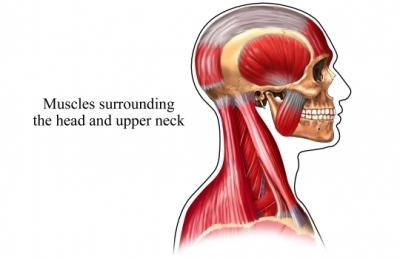 Go look at the diagram again it’s because the nerves are getting stretched inside the neck, the clusters at the endpoints are being strained, this will have consequences. The observation of a concussion for example during players head to head contact is that it is just the loading impact force getting transmitted into the brain that is the important feature to measure. But there is much more than this -there is also the follow through after the contact. During sophisticated reconstructions of NFL player head contacts employing finite element analysis. “Finite Element Analysis (FEA) was first developed in 1943 by R. Courant, who utilized the Ritz method of numerical analysis and minimization of variational calculus to obtain approximate solutions to vibration systems. Shortly thereafter, a paper published in 1956 by M. J. Turner, R. W. Clough, H. C. Martin, and L. J. Topp established a broader definition of numerical analysis. The paper centered on the “stiffness and deflection of complex structures”. FEA uses a complex system of points called nodes which make a grid called a mesh. This mesh is programmed to contain the material and structural properties which define how the structure will react to certain loading conditions. Nodes are assigned at a certain density throughout the material depending on the anticipated stress levels of a particular area. Regions which will receive large amounts of stress usually have a higher node density than those which experience little or no stress. Points of interest may consist of: fracture point of previously tested material, fillets, corners, complex detail, and high stress areas. The mesh acts like a spider web in that from each node, there extends a mesh element to each of the adjacent nodes. This web of vectors is what carries the material properties to the object, creating many elements. So back to the colliding NFL helmets. Using finite element analysis the distorted region during the follow through happens within the vortexing spider web of highest strain is calculated to occur in the mid-brain zone. Yet when concussions are talked about they are referred to the tethered brain rebounding inside the bony case of the skull, not much is directed to the inner strain of a spiders web as if it were warped around a distinct mid-brain zone of dissipation. Lets pull back for a brief instant. The brain is basically two hemisphere shapes underneath which is the central mid line region with the cerebellum at perpendicular angle to the rear end of the hemispheres. So if the mid brain zone is considered as a cylinder coming off the bottom of the brain. 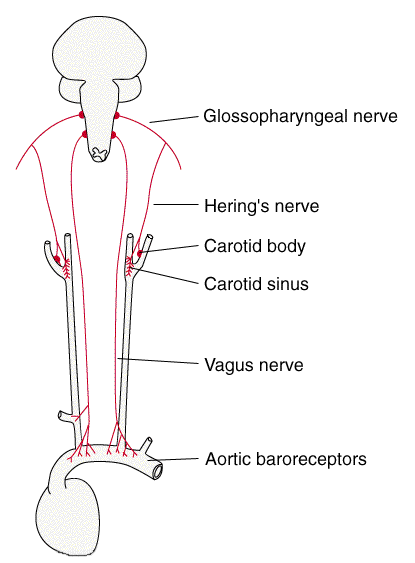 The cylinder in essence becomes the spinal cord entering into the neck vertebrae. But above the neck bones within the connections of the upper spinal cord is the medulla zone. Within this zone the finite element analysis depicts as if a spider web of mesh warps itself in a three dimension distortion field around the mid brain structures. The strain spills around the shape on the outside of the cylinder. But the tissue is all elastic so the shape distorts inside too. That my friend is the smoking gun for researchers for myself trying to get at,’what changes during a concussion?’ What I find amazing is that even though the description depicts the specific word ‘strain’- the tension mesh zone is essentially a tensegrity strain zone. Do you see why the principle of tensegrity is such a valuable tool to help resolve this finite element mesh warp of the mid brain zone? It’s both the architecture of the shape and the strain all dynamically responding together. So some observers might not be impressed with such a mechanistic point of view. The fact is: it’s a basic signalling system that is a core sensing system that has a huge heritage of action in Nature going back in the hierarchy of signals distributing sensing shape sensing. So that is the tensegrity window that I have referred to, toward helping to resolve the actual sequence of events as they unfold along a time line. 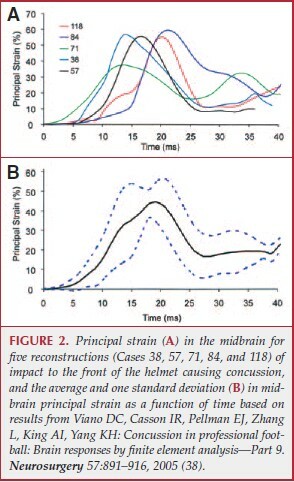 This has taken me the better part of two decades to learn this reference frame to watch the beginning of an observational opening toward how to study, how to approach: what a concussion force strain event changes within the brain. It simplifies into what is measurable , what control systems are perturbed within the finite element mesh vortex affecting the shape distortion vectors in the mid brain structures. This long verbose version above gets back to an observation on the duration of the concussive force. If a pendulum is allowed to impart a blow to a fixed head the concussion does not happen if the head is fixed immoveable during the impact. If however the head is not fixed, if the head displaces slightly in the distance of only 3mm according to the reported observations of Denny-Brown and Russell, a concussion now occurs. So rapid head displacement appears as a factor of concussion as a parameter to consider. When considering kinematic responses this is inclusive for head displacement, rotation and velocity of impact. It’s about a sequence of short acting forces measured in milliseconds, as if a slow motion camera were capturing the whole frame of changes. Rapid impact is measured in the vicinity of impact at 10 ms with rapid head displacement lasting 20 ms after the impact. Head impact forces peek between 6-8 ms and head accelerations declines by 10 ms. By this time the head has achieved its largest difference in velocity of displacement and rotation has begun to occur. By 20 ms the head has experienced large displacements and rotations, and the neck has deformed. Wow, it took a lot of breaking the sequence apart into steps of milliseconds in terms of head displacements and rotations then there is the key observation, describing the neck has deformed. Which gets back to the beginning of the observations from the Guelph physiotherapists noticing neck muscle issues associated with concussions. They separately treat the neck muscles to eliminate some of the post concussion signs, which seems to be getting at the observations defining the finite element analysis from breaking apart those NFL hits that were concussion producing hits. What do race drivers wear when they strap themselves into their 6 point harness inside their race cars, the drivers all wear head and neck devices, H.A.N.S. devices. They have reduced the incidence of severe concussions during violent crash/decelerations because they stabilize both the head and neck structures, they fix the heads into the mass of the torso toward reducing the net head displacement rotations. Makes a bunch of protective sense, don’t you think? Shape is determined from the inside supporting tensegrity structure toward determining the external appearance.